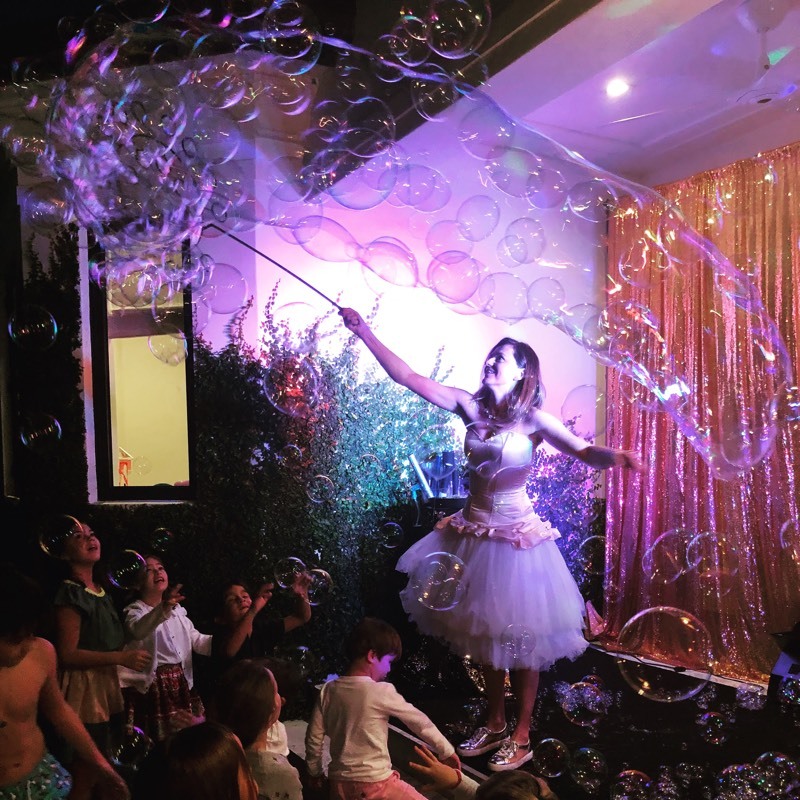 Bubble show is the best solution for an exciting children party. Bubble show is a most fascinating and eye-popping spectacle, because it is a concentration of magic and wizardry. Vivid and vibrant event will captivate even a savvy spectator. During the show, children will see science wonders of all colors, shapes and sizes. Ordinary bubbles become an exciting fun game for children. Kids like to watch iridescent transparent spheres quietly floating in the air. If even small bubbles make kids scream with delight, imagine how thrilled they will be by a bubble show where these colorful spheres are huge! Such spectacle can amaze not only little kids but also teenagers! The time when children party was ordinary and uninteresting is over. Today, children have fantastic opportunities. Now, celebration of any important event is exciting and fun, because each of them can become extraordinary. Using new services, an ordinary birthday party can become a real fairy-tale. A bubble show alone can evoke a flood of emotions in your child. Just imagine, people arrive during a party and give all guests a wonderful and unexpected surprise. The look of astonishment and smiles appear on the faces of all guests, because, indeed, seeing a huge bubble show live is a real surprise. It’s always coruscations of new emotions and celebration! For several years now, bubble show has been topping charts of the most popular shows for kids and adults. Bubbles become embodiment of good, positive mood, bright paints that can color any birthday party, make unforgettable celebration for children. Every child takes part in the show, they can make and pop bubbles. Kids gladly take bubble hoops and actively blow huge bubbles. Joy, laughter, fun – it is the best childhood for your kids that they will be grateful for, and birthday party is the best children holiday. A child expects something special from a holiday, and this day must be magical because life for children is a fairy-tale. You probably have seen eyes of children when they are making bubbles. Every bubble is a little miracle, it appears as if from nowhere and vanishes without a trace. For adults, there is nothing special in it, but for children it is a real joy. Magical bubbles made of a special soap solution allow to do absolutely incredible tricks. Children can play tennis with bubbles, blow giant bubbles and even get inside such bubble. In addition, the size of a bubble can be increased so that a whole company of kids fit in it. They will definitely try to stick their heads or arms through transparent, unburstable film. From inside it looks like everything around is iridescent. It is so amazing that such a thin, almost invisible dome completely envelopes a person and does not burst. You must see it! Everyone will have a chance to get inside a huge bubble and have it captured on photo! From our practical experience of children events we know that the biggest delight for kids is an opportunity to make such a soap wonder themselves. It should be noted that even without training children can achieve quite impressive results. We can include such interactive element into the party script, and children will feel themselves real Masters of Bubbles. Also our Show is educational. Because interactivity implies the revelation of bubble making secrets. Thus, while playing, children receive positive emotions, discover environment and laws of nature in a fun and unforced way. And adults – moms and dads, grandmas and grandpas – involved in the game will surely smile and return to their childhoods for a while. It should be noted that our soap solution is absolutely safe for children’s eyes and skin. It does not leave any traces on clothes or anything else. But in skillful hands it can bring unforgettable moments and create atmosphere of a true holiday. Give them ocean of fun and glee, because it is so wonderful when children are happy and laugh cheerfully. And you may be surprised to hear that adults also play with bubbles together with children and will not believe it, but you will definitely catch yourself doing it. You can order Bubble Show for a child’s birthday party at home, in a café, restaurant, daycare, school. Our bubble show at home will bring you fun and joy. Would love details for a seven old party outside. Just bubble show.